Cupidrone: love is literally in the air. 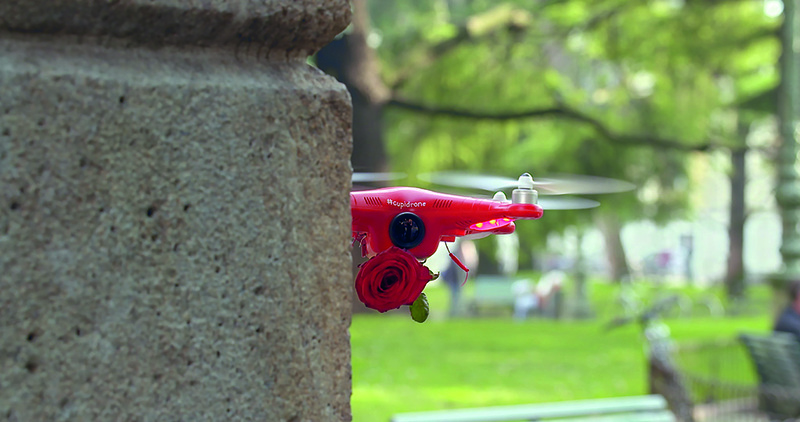 Love is literally in the air: meet #cupidrone! Delivering love from above, searching for targets armed with a red rose. Love is falling from the sky in the new Valentine’s Day film for Funnyhowflowersdothat.co.uk. Flowers are the most appreciated Valentine's Day gift! That's where Funnyhowflowersdothat.co.uk would like to make as many people as possible aware of. A real, fully operational drone called Cupidrone has been developed especially for Valentine’s Day. This modern day Cupid’s mission is to patrol the skies above the streets of Verona, searching for enamoured couples and lonely souls who are looking for love. When Cupidrone spots his target, he drops a red rose - delivered by stealth. So, what happens next? "Well, it looks like the traditional token of love – a red rose – still does its job perfectly in 2015. 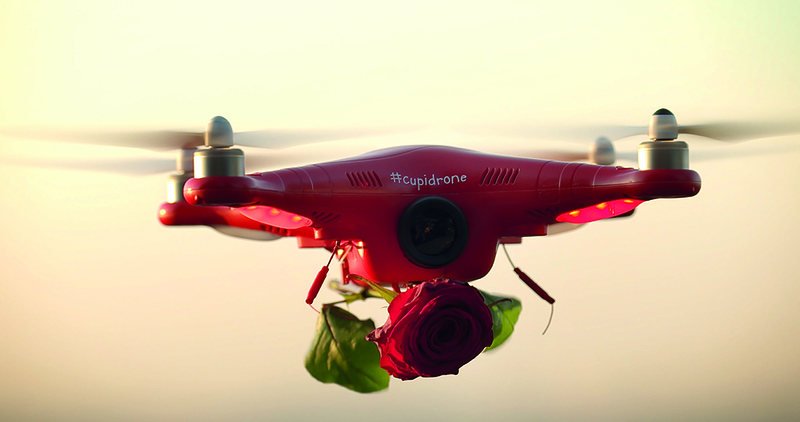 Cupidrone shows that flowers still have a very special effect on people." Accordingly to Ivo van Orden, Campaignmanager at the Flower Council of Holland. Last year, love and happiness was spread all over Paris with 1,500 little red emergency boxes. In Case of Love at First Sight Parisians could break the glass and help themselves to a rose. 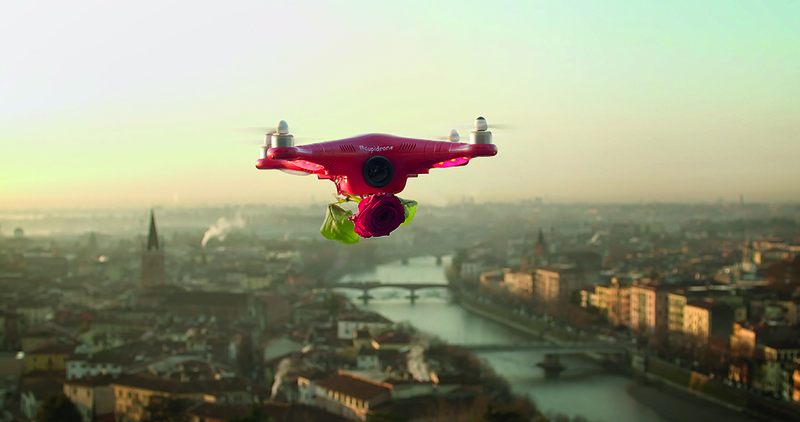 This year Cupidrone distributed love in Verona, home to the world’s most famous couple, Romeo and Juliet. The film even shows Cupidrone taking a peek inside Juliet’s famous balcony on Via Cappello. You can view the film on Funnyhowflowersdothat.co.uk and its three variants in the other core countries: Mooiwatbloemendoen.nl, Tollwasblumenmachen.de and Lajoiedesfleurs.fr. Relevant bloggers and editors of international online and offline lifestyle, fashion and women's magazines received red roses. The bouquet cards where signed by #cupidrone. With this gesture Funnyhowflowersdothat.co.uk wants to encourage bloggers and editors to write about the campaign in order to increase the reach. Through social media and various video platforms is distributed to a wider audience. The direction of this short film was in the hands of director Edwin Nikkels and was designed by advertising agency Kingsday in cooperation with Back2Back Productions. The beautiful red roses (Red Naomi) fired by Cupidrone where provided by rose grower Porta Nova.